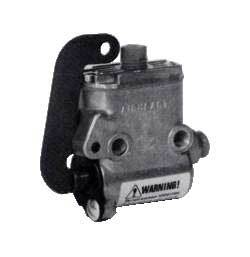 The Airheart Small Displacement, Lever Actuated Master Cylinder was originally designed for Go-Kart racing but it can also be used in industrial applications. The unit is availble with two configurations: lever up and lever down. Both configurations may be ordered for either automotive brake fluid or mineral based hydraulic (red) fluid.